Thanks to everyone who filled out our SitePoint Survey! A staggering 1,451 people took the time to reply. Your survey answers and comments are invaluable. The winner of the iPad Air has been emailed, and the prize is on its way! Most survey respondents want to see more tutorials on SitePoint. Weâ€™re happy to oblige, since tutorials have always been our top priority. In second place, video content was the next popular request. While weâ€™ve focused our video efforts on Learnable, our online learning platform, weâ€™re also hard at work on producing more video content this year. Stay tuned! 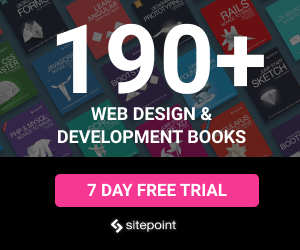 The most popular SitePoint offering? Our newsletters, including Versioning our daily update for web developers. Keen to keep the discussion going? You might like to visit the all-new SitePoint Forums. This week, weâ€™re talking about the difficulties of going from newbie developer to employable coder, and discussing the pros and cons of dependency injection.